Office for lease in District 1 at Deutsches Haus Ho Chi Minh, Grade A office building, contact sales office: 0979771188 Office for rent in Ho Chi Minh City. Deutsches Haus Ho Chi Minh City, will be the first building in Vietnam and one of few in South East Asia awarded with two energy-efficiency certificates: DGNB Silver and LEED Platium. The Federal Ministry of Economic Affairs and Energy of Germany granted Deutsches Haus Ho Chi Minh City the “EnEff”distinction applying state-of-the-art sustainable energy-efficient building-solutions and technologies “Made in Germany”. The 25-storey building, strategically located in the corner of Le Duan and Le Van Huu Street in District 1, HO Chi Minh City, offers 30,000 net square meters office space for lease to the market. As stated in its name, the building will house the Consulate General of the Federal Republic of Germany and major German and European firms. Air Condition Spec: High performance using high efficiency chillers (targeting 131 kWh/m2/annum or 36% less than benchmark average usage). 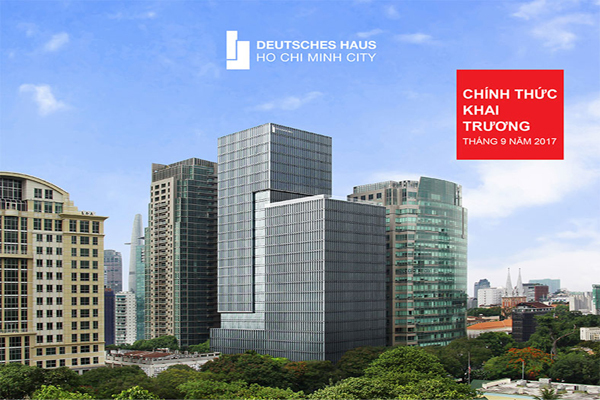 Legal Ownership: Deutsches Haus Ho Chi Minh Stadt Ltd.